Our last tasting of the day on our Walla Walla wine tour weekend was at L’Ecole No. 41 in the historic Frenchtown School just outside of Walla Walla in Lowden. 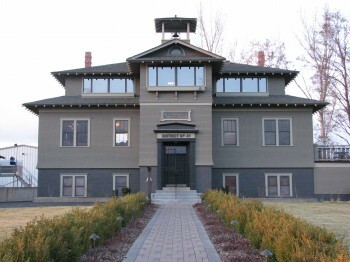 The building was built in 1915, to replace the first Frenchtown School, a log cabin from 1870. 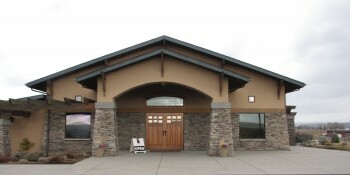 L’Ecole was founded in 1983, and is the third oldest winery in the Walla Walla area. We arrived towards the end of the day, but our server was more than gracious about guiding us through a tasting and answering our questions. The tasting room retains many of the original historic features, including the hardwood floors, and has been decorated with period Barrister Bookcases collected by the winery’s original owner. The ambiance of the tasting room just adds to the charm. We began with the 2011 Estate Luminesce, a blend of 67% Semillon and 33% Sauvignon Blanc, from Seven Hills Vineyard. It showed tart citrus and floral flavors. Then we had the 2011 Columbia Valley Chardonnay, a very well balanced wine with apple and minerality on light oak. It is a Chardonnay that both Jon and I can enjoy because it is a great balance between the unoaked Chards that I love and the big, buttery Chards that are Jon’s favorites. Moving on to the red wines, we started with the 2009 Estate Merlot, with grapes from the Seven Hills Vineyard. It was a nicely balanced wine with medium tannins and black cherry flavors. The 2009 Cabernet Sauvignon is a bold wine aged in 40% new oak, with flavors of tobacco and heavier tannins. Next we tried the 2009 Estate Perigee, a blend of 64% Cabernet Sauvignon, 16% Merlot, 12% Cabernet Franc, and 4% Malbec, and 4% Petit Verdot. This is a very elegant Bordeaux blend that was aged for 22 months – a very nice wine. The last wine that we tasted was the Candy Mountain Vineyard Red Wine. It hasn’t been released yet; it will come out in April 2013. It is a blend of 57% Cabernet Sauvignon and 43% Merlot. This is a fantastic wine with flavors of blackberry and chocolate. There are only 350 cases, and I’m sure it will sell quickly. I was pretty disappointed that I couldn’t buy it that day! It was a great end to a wonderful day of wine tasting – L ‘Ecole was a real treat. After leaving Va Piano, and getting some recommendations from the server there, we headed back into downtown Walla Walla to check out some of the wineries in the City Center. After parking the car, we headed down the street and were intrigued by a logo of a man in a bowler hat. We stopped inside. Otis Kenyon is located in a long and narrow space in one of Walla Walla’s historic buildings on Main Street. The space has hardwood floors and beautiful high ceilings. I’m not sure if they have just recently relocated to the space, but it seemed like the space isn’t finished yet; their tasting bar seemed to be a 6 foot folding table with a tablecloth. Our server guided us through one of the fastest tastings I’ve ever been through! Sadly, she didn’t tell us anything about the wines, or the history of the winery, or even talk to us at all. So, what I can tell you has been gleaned from other sources. 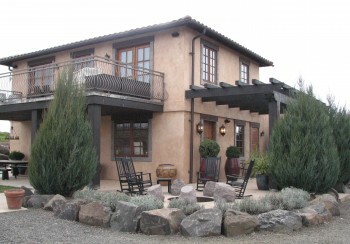 We tasted three wines – their 2008 Matchless Red, the 2009 Merlot and the 2010 Cabernet Sauvignon. The Matchless Red was balanced and approachable with medium tannins and lots of fruit. It is a blend of 53% Cabernet Sauvignon and 47% Merlot. The Merlot and the Cabernet Sauvignon weren’t my style though – they both had very heavy tannins and strong smoke flavors. After leaving Otis Kenyon, I looked up a bit more about them. I was curious about the man in the bowler hat and the interesting name of the red blend wine. As it turns out, there is a story there. In the early 1900s, James Otis Kenyon was working as a dentist in nearby Milton-Freewater. He had a wife and kids, and was struggling to make ends meet. And then another dentist set up shop – Competition! For some reason, James got the idea to burn down his competitor’s office and he got caught. While he was serving time in jail, his wife left him with the kids and moved to Walla Walla, and planted the idea that he was dead. Almost 50 years later, James Otis Kenyon’s grandson Stephen discovered that his grandfather was still alive and living on the Oregon Coast – and happily the two met and formed a relationship that lasted until James’ death at the age of 101. Stephen owns Otis Kenyon Wine and wanted to pay tribute to his grandfather – the man in the bowler hat is a silhouette of James Otis Kenyon, and Matchless Red is a nod to his criminal past. Being the history nerd that I am, I wish our server would have shared that story with us! After leaving Northstar Winery, we followed the recommendation of our server and headed back down the road we came in on for a stop at Va Piano Vineyards. The name, for those of you who think it sounds unusual for a winery, comes from the Italian saying, “Chi va piano, va sano e va lontano.” He who goes slowly, goes safely and goes far. As the story goes, the winemaker spent his senior year in college in Italy, where he fell in love with the Italian wine industry and decided to make a career out of it. The vineyards were planted in 1999, the first vintage (2003) was released in 2005. The tasting room is set on a hill with a beautiful view, and is styled after a Tuscan Villa. It is a beautiful facility. But Jon and I were a little worried before we went in, because there was a white, stretch limo parked outside… Oh dear, Bachelorette Party? But it turned out to be just one couple in the limo, with a woman about my age being treated to a nice birthday wine tour weekend! The atmosphere in the tasting room was light and fun, and the two other couples there were friendly and eager to interact. Our tasting began with a 2011 Sauvignon Blanc, which was blended with a touch of Riesling. This wine is excellent; very crisp with a green apple finish. I think it is very similar to New Zealand Sauv. Blancs that I like so well. Then we moved into the reds, with a Cabernet Sauvignon called Bruno’s Blend. It had medium tannins, light oak, and flavors of raspberry. Very good! The next wine was a library release – a 2006 Cabernet Sauvignon, that had much heavier tannins and oak that the earlier blend – it didn’t have much fruit left. This wine was too much for me. But their 2009 Cabernet Sauvignon had much more fruit and acidity with flavors of black raspberry. I thought it was very nice. The tasting ended with their 2009 Syrah – all I wrote was “very good!” I do remember that it is very similar to the 2006 Dobbes Family Estate Syrah that we bought down in Oregon on a tasting trip there. That was one of the best Syrahs I have ever tried, so that says a lot about the Va Piano Syrah. We left with the Sauvignon Blanc and the Syrah – not bad for a place we had never heard of! After our lunch at Olive, Jon and I decided to begin our day tasting at Northstar. Northstar came with the recommendation of a friend of mine from childhood, and since we didn’t really know much about any of the Walla Walla wineries, that seemed good enough for us. Northstar was founded in the early 1990s, with their first vintage in 1994. David Merfeld has been their winemaker since 2005. Our server was a friendly gentleman who had spent years in the ski industry, and then started working part time at Northstar after he retired. We were the only ones there, which seemed a little unusual, as it was about 2 in the afternoon on a Saturday, but we chalked that up to the mountain passes being bad (two other couples were heading in as we were heading out). 2011 Stella Blanca Semillon – a blend of 93% Semillon and 7% Muscadelle – which was interesting because Muscadelle is not typically seen in Washington. The Stella Blanca was crisp and bright, with flavors of honey and citrus – it was very appealing. The tasting notes say there are flavors of coconut, but I didn’t taste any. Since this was one of the wines only available at the winery, I made sure to buy a bottle. 2009 Stella Maris Red Blend – another blend of 65% Merlot, 12% Syrah, 11% Petit Verdot, 6% Cabernet Sauvignon, and 6% Cabernet Franc. This blend was a pretty bold spicy blend with flavors of vanilla interspersed. 2009 Northstar Petit Verdot – I’m always intrigued when a winery does Petit Verdot as a varietal wine, and this one is very good. It is dark and rich with fruit, and would be excellent paired with dark chocolate. Also available only at the winery, so I left with a bottle of this one too. 2009 Northstar Malbec – Interestingly, this wine is the only wine sourced from Northstar fruit, plus Spring Valley vineyard grapes. Considering their specialty is Merlot, I would have thought their estate would be planted with Merlot. This Malbec is fruit forward and smooth, with white pepper flavors adding a bit of spice. 2009 Northstar Columbia Valley Cabernet Sauvignon – This wine had flavors of blackberry, raspberry and vanilla, and was lightly oaked. I often don’t favor Washington cabs, as they are too bold and oaked, but this one was approachable and pleasant. 2009 Northstar Columbia Valley Merlot – Our server did a side by side tasting of this wine and the Walla Walla Merlot (below), so you could compare the two wines and the differences imparted by the vineyard and the climate. This wine had flavors of of vanilla and blackberry, and was very smooth. After tasting both wines several times, this one was my favorite by a nose. 2009 Northstar Walla Walla Merlot – this wine has flavors of raspberry and blackberry and excellent, but it was still a bit tart. I think this would have been my winner if it had a few more years on it. Jon declared this wine his favorite. All in all, Northstar has some very good wines, and there certainly wasn’t a bad wine in the bunch. I have to disagree with the Merlots being their best wines though – I thought their standouts were the Stella Blanca, the Petit Verdot and the Malbec. The tasting fee is $7, but is refundable with purchase – and the spacious tasting room would certainly be able to accommodate busy days without making the place seem crowded. If I get the chance to visit in the summer, the patio would be a great place to relax and enjoy a tasting or a glass of wine. After we purchased our Stella Blanca and Petit Verdot, I asked the server which other places he would recommend, particularly any wineries that had some white wines. One of his recommendations was Va Piano, which I had never heard of before we started getting ready for our trip. And that’s where we headed next! After we braved the pass for our Eastern Washington weekend, we made it to Richland, got settled into our hotel for the weekend, enjoyed a nice swim in the pool, and headed to bed to get a good night’s sleep before Jon’s half-marathon in the morning – the Tri Cities Half Marathon. 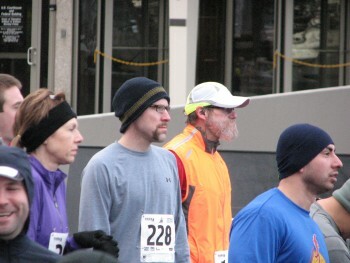 We were staying just a half mile down the road, so we were nice and close so Jon could check in and get warmed up. Due to Jon’s quick feet, he was done with the race by 9:30 am, so we went back to the hotel so he could get a shower, and we were on the road to Walla Walla for the day’s touristing by 10:30 am. Walla Walla was our destination for the day – a little more than 45 minutes from the hotel where we were staying. The drive is a flat easy drive along the river and through some pretty country, with a large national wildlife refuge, and some run down towns along Highway 12. And some cows (sorry I just had to get that in there, because I think cows are really cute). On the drive, we talked about where we wanted to visit, and where we should start. Once we made it to downtown Walla Walla, our first stop was all for Jon. He had been dreaming of a record store, and Walla Walla has what claims to be the oldest independent record store in Washington state – Hot Poop Records. Yes, you read that right. Upon entering Hot Poop, you get the distinct impression that if you were to die in there, your body may not ever be found. The place was absolutely filled to the rafters with music. I have a feeling that this place had a copy of every CD and record that was ever made. But you might not be able to find it, because alphabetizing and organization were very loosely applied there… Jon enjoyed himself though, and managed to find a couple of treasures that he was pretty excited about. 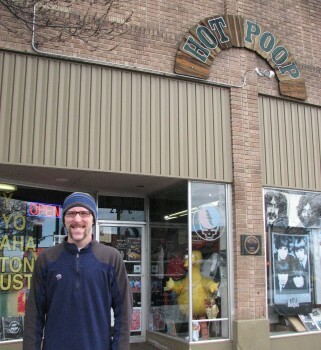 Jon Posing At Hot Poop Records – Ignore His Geeky Expression! After Jon got his fix of Hot Poop, it was time to get some lunch! We headed down Main Street and checked out a deli that was recommended by one of the wine books I have. Olive Marketplace and Cafe had some great food and a lot of selection on their wine list. As we were going to be tasting after lunch, I didn’t have any wine with my meal, but it would be the perfect place for a Saturday afternoon glass of wine with your meal. 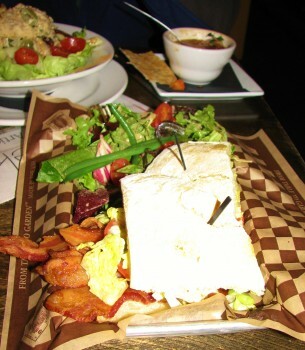 I had the BLT with Hills Applewood smoked bacon, avocado, tomato and butter lettuce on a ciabatta roll. It was served with a side salad with an assortment of lettuce and toppings. Jon had the Apricot Chicken salad, with apricots, red grapes, butter lettuce, hazelnuts, grilled chicken and fresh tarragon aioli. Jon also had a cup of their lentil and sausage soup of the day; it was thick, creamy and delicious. Now that we were fueled up, we were ready to start tasting some wines!